The Clinton News Network, also known as CNN, struck again on Monday, editing comments made by GOP nominee Donald Trump to give the false impression that he called for racial profiling, The Hill reported. CNN added the word “racial” to Donald Trump‘s Monday comments on terrorism and immigration, and is running headlines reporting that the GOP nominee is advocating “racial profiling”. 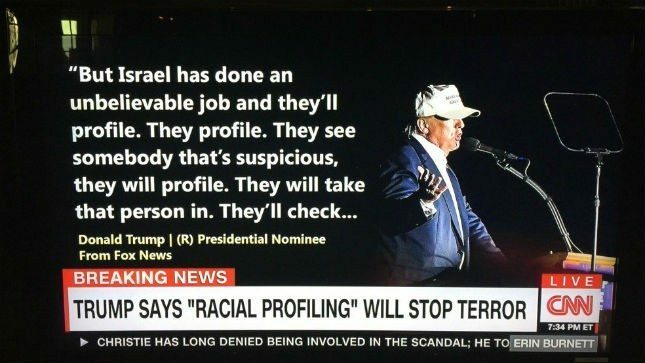 In a later interview with Bill O’Reilly, Trump also expressed a need to profile in the manner Israel does, but again didn’t use the word “racial.” But when pressed by O’Reilly how it could be determined how a person could be deemed suspicious, Trump wouldn’t elaborate. Got that? Trump NEVER used the word “racial,” but the propagandists at CNN added it to paint a false picture and distort his comments. Throughout the day, Concha added, CNN ran headlines twisting and distorting his comments. “CNN.com also is using the term racial profiling in its headlines,” he said. NBC’s Chuck Todd: ‘Who cares’ if Hillary’s people pushed birther rumor in 2008?